Advert for the Caroline Club from an August 1965 edition of the German ‘Musik Parade’ magazine, courtesy of Hans Knot. 3 DM would get you a Caroline brochure, photos of the DJs, a Caroline car sticker and other goodies. The information for these pages has come for a variety of sources. It has been gathered over the years from numerous newspaper and magazine articles, from radio station press releases, from reference books and from some of the DJs themselves. If you spot any mistakes or have further information please get in touch. Many thanks to those who have already done so including Mary, eights Peters, one Pete, Duncan, three Steves, five Tonys, six Davids, six Daves, Des, three Pauls, Declan, Errol, two Rays, Roy, five blokes called Chris, Ken, Wayne, four Johns, Martin, Martyn, Margaret, Tim, Tom, four Keiths, Kees, three Grahams, a Grahame and a Grahme, four Stuarts, Wendy, seven Bobs, Rob, Kenny, Rachel, Johnnie, Helen, Alma, two Andys, four Ians, two Georges, Arthur, Jan, two Bills, a Ben, André, two Andrews, Miles, Clive, four Alans, Norman, two Jerrys, one Gerry, Jimmy, Jim, three guys called Hans, a Michael, two Micks and four Mikes, Michel, two Carls and a Karl, Gary, Woolf, a couple of Ricks, Bruce, Natalie, Roma, Roger, Carolyn, Ed, Ted, Raoul, four Nicks, one Nik and a Nico, Doug, James, Ruth, Maggie, four Richards, Dickie, Susan, Alex, Hannah, JJ, Jack, three Colins, Lynne, Jon, Jonathan, Susannah, Luuk, Look, Lars, Eric, Simon, Shirley, Phil, Wim, Ronnie, Robbie, three Geoffs, two Jeffs, Gary, Thule, Gordon, Greg, two Normans, Harm, Ross, Roland, Joanna, Joyce, Albie, Petra, Jelle, Jempi, Bernard, Derek, Charlie, two Manfreds, Munro, Penny, Brian, Nigel, Fred, two Harrys, Michele, Mavis, Byron, two Terrys, Terje, Marion, Onno, Howard, Fiona, two Robins, Edward, Scott, Philip, Gareth, Per A and Per B, ‘PY the pork pie’ (sadly no longer with us), the groovy Mark T and Clive from Hot'n'Gold. Offshore Echo's which has been published five times a year since 1974 and is the country's premier free radio magazine. Most of the DJ theme tune information included in The Pirate Radio Hall of Fame came from a series of articles in Offshore Echo's. Other theme tune details have come from Jim Parkes' Encyclopedia of Offshore Broadcasting. Monitor which was a fantastically detailed and well-researched fanzine produced with tender loving care until his death by Roland “Buster” Pearson. Some articles from back issues of the magazines are now available on-line at Monitor and Monitor 2(b). Radio News - a free four-page supplement published in the London Weekly Advertiser during early 1967. Beatwave (or Beat Wave, the precise name varied) which lasted for a couple of issues in 1967. The Caroline Movement Bulletin, which supported and reported on Caroline and Laser during the eighties. Dee Jay & Radio Monthly which put out about a dozen issues during the early seventies. Free Radio News - published by the Free Radio Campaign in the late sixties and early seventies. Free Radio Times - launched in 1969 by the Free Radio Association. After one issue it changed its name to Sound. Far Out At Sea by Gordon Kelly, published 2014, is a history of Radio Seagull covering its broadcasts from the Mi Amigo and the Jenni Baynton. From International Waters by Mike Leonard. Published 1997 by Forest Press. This massive book covers sixty years of offshore radio from early attempts in the 1920's to the very last stations off the coast of Israel. The same author is also responsible for The Beat Fleet. 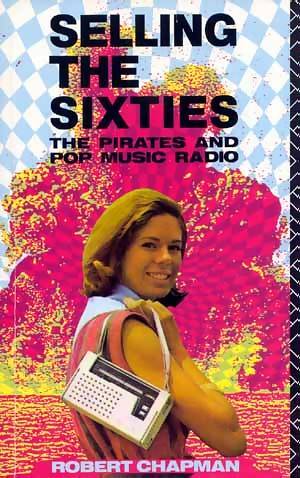 This smaller volume, published 2004, concentrates on the British stations of the sixties. It is available from Amazon or direct from the publisher: Forest Press, PO Box 1, Heswall, Wirral CH60 3TH, price £9.99 (plus £2.75 postage and packing within the UK). The Last Great Adventure for Boys by Bob Lawrence (Caroline DJ Richard Thompson) is a novel set on a fictionalised version of Radio Caroline during the late seventies. Some of the characters are based on recognisable personnel (just reverse the names of Matt Rogers and Russ Stewart to discover who they possibly may be based on) but others are purely from the author's imagination. For more details, see thelastgreatadventureforboys.co.uk. Last Of The Pirates by Bob Noakes, published 1984 by Paul Harris Publishing. This excellent ‘warts and all’ account of the author's time on board the Mi Amigo and Mebo II during 1973-4 was re-published in an updated edition in 2009. The London Sound by Brian Long. Privately printed and published, this epic and fascinating labour of love tells the Radio London story in the minutest detail. All copies have now been sold. Making Waves by David Sinclair, published 2015, is the story of the author's time as a DJ on Radios Essex, 270 and 390. It is available to download as an e-book from Lulu.com, the Apple iBookstore and Amazon. It includes a foreword by your webmaster. Manx Giant by Andy Wint, published 2008 by Chesterfield Publications, is the story of Radio Caroline North, written to coincide with the convention and exhibition held on the Isle of Man to mark the fortieth anniversary of Caroline's demise. The Music Spinners: Britain's Radio DJs, edited by Nik Oakley and Dave Gotz, published in 1976 by MRP, it is an A to Z of the country's broadcasters of that time. Offshore Radio by Gerry Bishop. Published in 1975 by Iceni Enterprises. Encyclopaedic and comprehensive, it is complete up to the closure of the Dutch pirates and the return of Radio Caroline to the UK coast in 1974. Pirate Jock by Jack McLaughlin, published 2012 by Kenny & Boyd, is a fictionalised account of the author's career as a DJ on Radio Scotland (see review). A second volume covering his time with Britain Radio, Radio 270 and Radio 390 is promised. 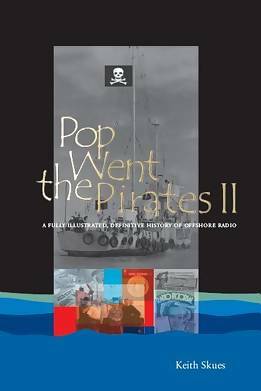 Pirate Radio: An Illustrated History by Keith Skues and David Kindred, published 2014 by Amberley Publishing. A 160 page hardback book, it features more than a hundred of David Kindred's fantastic photos while former pirate DJ Keith Skues tells the story of pirate radio in Britain. Pirate Radio Then And Now by Stuart Henry and Mike Von Joel. Published 1984 by Blandford Press, it is a diary of offshore events from the sixties to the birth of Laser-558. Pop Went The Pirates by Keith Skues. Published 1994 by Lambs Meadow Publications to tie in with offshore radio's thirtieth birthday. The definitive account of the British pirate era written by someone who was an integral part of it. 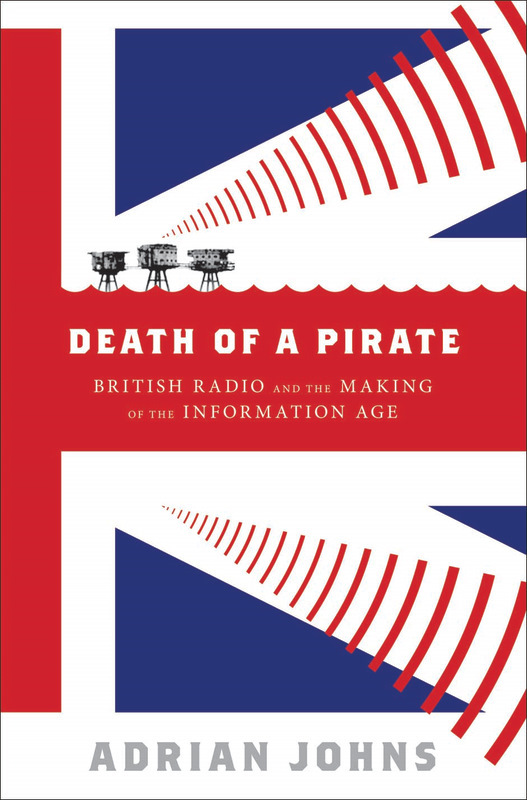 Many of the birthdates in The Pirate Radio Hall of Fame have come from this highly recommended book. A revised edition, Pop Went The Pirates II, was published in hardback in 2009 and is available from www.popwentthepirates.co.uk and Amazon. Radio 270 - Life On The Oceaan Waves, published 2002, and Radio Caroline North: Rockin' & Rollin', published 2004. Both by Bob Preedy. Radio Caroline by John Venmore-Rowland. Published by Landmark Press in 1967, just ahead of the introduction of the Marine Offences Act, it covers Caroline's early years. Radio Caroline: The Pirate Years by Ralph C. Humphries, published 2003 by the Oakwood Press. Despite the title, this is actually a brisk journey through the history of all the offshore stations, not just Caroline, from the fifties to the sinking of the m.v Mi Amigo in 1980. Not entirely error-free (it claims that Caroline played the Rolling Stones' Satisfaction and the Beatles' All You Need Is Love during the opening weekend of Easter 1964. Neither had even been recorded then!) but it is still an interesting addition to any fan's library. 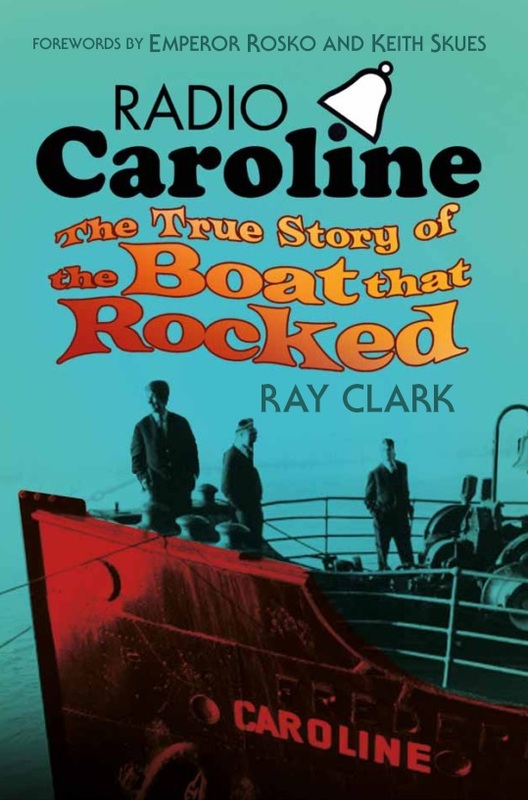 Radio Caroline: The True Story of the Boat that Rocked by Ray Clark, published 2014 by The History Press. 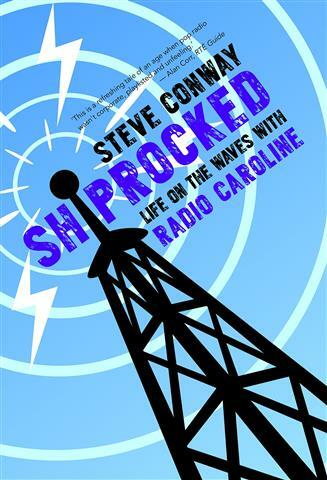 This excellent book tells the story of Radio Caroline from its birth in the sixties to the end of its broadcasts from international waters. Reviewed here. Ships In Troubled Waters by Nigel Harris, published 2009 by MyWayPublishing, is an autobiographical journey through the author's radio career (initially under the name Stuart Russell), taking in spells on the Voice of Peace, Irish radio, a couple of failed offshore projects and many eventful years with Radio Caroline through the seventies and eighties. Selling The Sixties: The Pirates And Pop Music by Robert Chapman. Published by Routledge in 1992, it is an analysis of the programme policies of the original sixties offshore stations. It is available in hardback or paperback from Amazon. Shiprocked by Steve Conway, published 2009 by Liberties Press. The author was on Radio Caroline, initially as a newsreader, then DJ, then Programme Director, at the end of the station's time at sea. In fact he was one of the final crew rescued from the ship when it ran aground on the Goodwin Sands in November 1991. A revised edition was published in 2014. The Wet And Wild History Of Radio Caroline 1964-2004 edited by Hans Knot and published in 2004 to coincide with Radio Caroline's fortieth birthday. It contains reminiscences from a wide range of people who have been involved with the station over the years. One for the serious offshore enthusiast, it can be ordered from the publisher, The Foundation for Media Communication, at PO Box 53121, 1007 RC Amsterdam. In Holland and Belgium it costs €25. Everywhere else, it is £20. More details here. 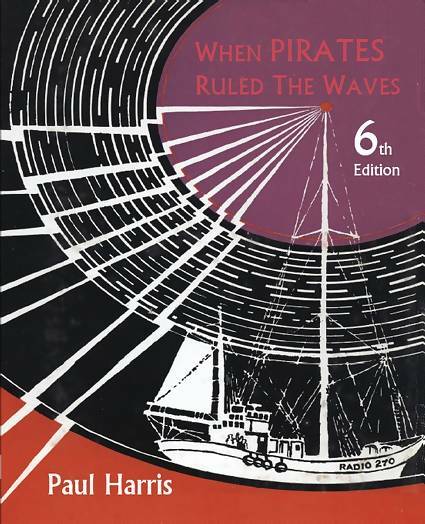 When Pirates Ruled The Waves by Paul Harris. Originally published in 1968, it then told the story of UK offshore radio up to the towing-away of the two Caroline ships in March of that year. It has since been combined with a later book covering the Dutch pirate era to produce a new edition which takes the story up to the mid-seventies. See here for details. Who's Who In Pop Radio by Peter Alex. Published in 1966 by New English Library, it contains photographs and biographies of every DJ working in radio at the time. The Wonderful Radio London Story by Chris Elliot. Published in 1997 by East Anglian Productions to coincide with the thirtieth anniversary of the station's demise. A very detailed account of the life of Britain's most successful pirate. Keith Skues's definitive history of offshore radio, now revised and updated. It is available in hardback from www.popwentthepirates.co.uk and Amazon. Adrian Johns tells the story of Radio City's owner Reg Calvert and how he met his untimely end - and much more besides. Reviewed here. Available from Amazon in hardback, paperback and Kindle download. This is the story of Radio Caroline's final months afloat, told by the station's last sea-based Programme Controller. Available from Amazon and the Radio Caroline Society. A recently published 6th edition of Paul Harris's book. The original only went up to 1968 but this edition incorporates his later book To Be A Pirate King to take the story up to the mid-seventies. Available from Amazon. Ray Clark's history of Radio Caroline from the beginning to the present day is available from Amazon or the Radio Caroline Society. It is reviewed here. Rob Chapman's detailed analysis of the programmes transmitted by the sixties offshore stations is available from Amazon in hardback, paperback or Kindle download.